This still life may be dated to the 1750s. Chardin executed a large number of similar compositions symbolizing music, painting, etc., of which Wildenstein's Catalogue lists 21. In its subject matter the Pushkin Museum picture is close to Still Life with the Attributes of the Arts in The Hermitage (1766, Inv. No 5627), its variant (1769?) in the Minneapolis Museum of Arts (USA), and Still Life with the Attributes of the Arts in The Louvre. The latter was exhibited in the Salon of 1765. 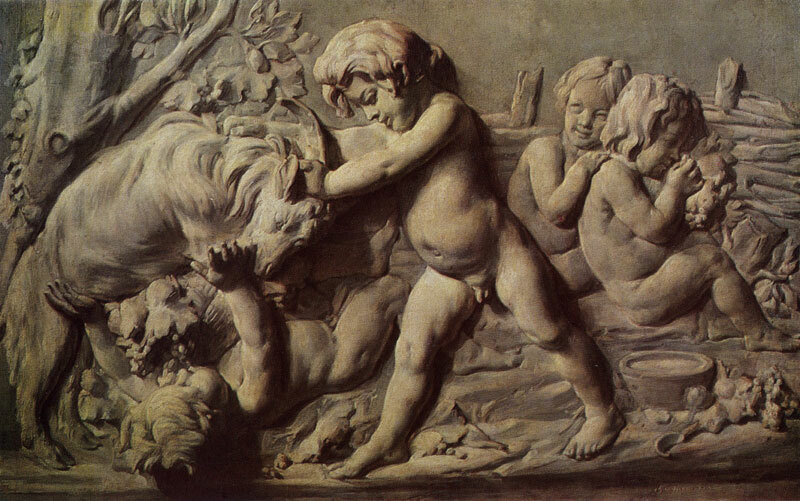 After Bouchardon's bas-relief. 1770 Oil on canvas. 51 X 82.5 cm. Inv. No 1139 Signed and dated lower right: Chardin 1770 The picture is the imitation of Bouchardon's bas-relief Autumn which constitutes part of his sculptural group Seasons of the Year installed in the Rue de Crenelle fountain in Paris. Among Chardin's works there are at least twenty compositions imitating bas-reliefs and dating from different years of his artistic career. Bibliography: Кат. ГМИИ 1948, p. 86; Кат. ГМИИ 1957, p. 148; Кат. ГМИИ 1961, p. 195; D. Diderot, OEuvres completes, vols. 1—12, Paris, 1875—77, vol. 11, p. 48; Reau 1929, No 452; G. Wildenstein, Chardin, Paris, 1933, No 1203, ill.; G. Wildenstein, Chardin, Paris, 1968, No 362, ill.